Luton Town boss Nathan Jones suffered his first defeat since taking charge of the club with a 2-0 reverse against Notts County this afternoon. With the hosts looking like they were about to go through the gears in the second, an unfortunate own goal from former Magpies defender Alan Sheehan saw the visitors move in front, while Jon Stead bagged a second with 20 minutes to go to kill off any hopes of a comeback. Defeat was harsh on the Hatters who had impressed once more with their approach throughout the game, always trying to get the ball down and play on the floor, with plenty of murmurs of appreciation from the home faithful. 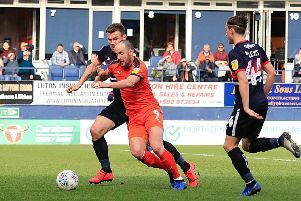 However, results are what Jones will be based on, and too often Luton’s approach play faltered in the final third, leading to a seventh home defeat of the season, Hatters failing to score in their last three at Kenilworth Road too. Hatters named an unchanged side as Pelly Ruddock Mpanzu made consecutive starts for the first time since October 2014, with keeper Mark Tyler fit enough to be back on the bench, where he was joined by young striker Zane Banton and recent loan signing Joe Pigott. The hosts took a while getting into their stride though as they found County a tough nut to crack early with chances at a minimum. Ruddock Mpanzu missed the best opening on 15 minutes when a header out fell perfectly on the volley, but with time on his side, he shanked well over. McCourt then magnificently tricked his way past two defenders, his low shot blocked by a covering third, while Cameron McGeehan’s effort was too close to Roy Carroll. Town were upping the pressure, with Ruddock Mpanzu and McGeehan to the fore, as the latter side-footed wide and then just didn’t quite have the legs to gather his team-mate’s through ball. Despite Luton looking the better side, County had the best chance on 28 minutes when Adam Campbell teed up Izale Mcleod who fired over the top on his left foot. Back came Hatters as Ruddock Mpanzu’s blast was palmed aside by Carroll, while Luton did have the ball in the net on the half hour mark, through Mackail-Smith’s astute finish. However, for the third time this season, he was to be left disappointed as referee Keith Hill spotted a quite blatant handball from McGeehan in the build-up, with the midfielder booked for his obvious indiscretion. Mackail-Smith then took matters into his own hands, somehow out-jumping Haydn Hollis, beating another man and from 25 yards, forcing Carroll into a sprawling stop. Still the chances kept coming, with Justham producing an excellent block from Stead, while the Magpies should have been ahead as half time approached. A miscommunication at the back saw Scott Cuthbert head the ball virtually out of Justham’s hands and Stead’s follow up was narrowly missed by the onside Mcleod. Luton went straight down the other end though and fluffed a glorious chance of their own, with Ruddock Mpanzu bearing down on goal only to somehow drag wide of the mark. After the break, Hatters tried to make a fast start once more, as they got into a number of promising positions, but the final ball was unfortunately never quite right. The Kenilworth Road were impressed by what they were witnessing , but the mood was punctured somewhat on 58 minutes when County overloaded on the right and Campbell’s cross was diverted past Justham by Sheehan against his former club. Jones reacted by bringing on Pigott for his debut along with Olly Lee for Smith and McGeehan. The new boy almost had a opening straight away, found by Ruddock Mpanzu as his shot deflected into Carroll’s hands. However, County then had a killer second goal on 70 minutes as Stead picked up possession, drove at the heart of the home defence and with Justham far too slow to come out, stretched to slot the ball through the keeper’s legs. Town tried to muster a comeback, McCourt’s deep cross headed at Carroll by Pigott, with the Northern Irishman then volleying at his fellow countryman from distance. As time ticked away, Pigott came closest to what would have been a deserved consolation and debut strike, spinning well to fire a volley that was heading in but for Hollis on the line. Hatters: Elliot Justham, Stephen O’Donnell, Jake Howells, Scott Cuthbert (C), Alan Sheehan, Alex Lawless, Jonathan Smith (Olly Lee 62), Paddy McCourt, Cameron McGeehan (Joe Pigott 62), Pelly Ruddock Mpanzu, Craig Mackail-Smith (Paul Benson 85). Subs not used: Mark Tyler, Jack Marriott, Magnus Okuonghae, Zane Banton. Stags: Roy Carroll (C), Blair Adams, Scot Bennett (Alan Smith 46), Haydn Hollis, Curtis Thompson, Liam Noble (Rhys Sharpe 90), Elliot Hewitt, Adam Campbell, Wes Atkinson, Jon Stead (Ronan Murray 76), Izale Mcleod. Subs not used: Scott Loach, Graham Burke, Thierry Audel, Stanley Aborah. Booked: Lawless 2, McGeehan 32, Mcleod 60. Hatters MOM: Pelly Ruddock Mpanzu - did his best to find a way through for the Hatters. To vote for your Hatters MOM, visit our Hatters Microsite.